Tonight I tried another recipt with Napa Cabbage, or Chinese Cabbage as we call it in Sweden. This was also made in the program China´s Food sent on SVT 1, with Peter Önnewall. This dish can be used as a side dish or as a main dish. In the program they added crabs in the dish. I mixed with some fish and it was very good. Cut the cabbage on the middle so the thicker white bottom is parted from the thinner green. Cut the cabbage lengthwise in about ½ cm thick shreds. Heat the oil in a wokpan. Wok the cabbage a few minutes until soft. Start with the thicker parts and put the thinner green in towards the end. Take the cabbage from the wok as it is soft. Chop the springonions and ginger and wok in the heated oil a half minute. Add the rest of the ingredients and add the cornstarch witch has been dissolved in water. This should make a sauce. Stir and put back the cabbage in the sauce and stir around. Serve immediately as a side dish with for instance fish or meat, or slice fish or meat and mix with the woked cabbage. You can also mix with crabs or shrimps or anything of your liking. I had some small pieces of fish left over, so I cut it in small pieces and mixed in when I had woked the cabbage. 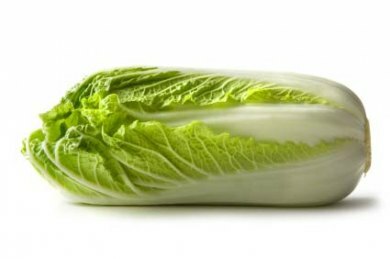 I read on the internet that if you really want to succeed with your diet you should eat this kind of cabbage. There are so many ways to prepare dishes from it, just search recipts on the net. Dela kålbladen på mitten så att den lite stabbigare vita delen separeras från den tunnare gröna. Skär kinakålen på längden i ½ centimeter breda strimlor. Hetta upp oljan i en wok eller stekpanna med höga kanter. Fräs kinakålen någon minut eller tills den mjuknar. Börja med de kraftigare vita delarna och lägg i de tunnare gröna delarna mot slutet. Ta upp kinakålen och lägg åt sidan. Lägg i salladslöken och ingefäran och låt fräsa i oljan en halv minut. Tillsätt de övriga ingredienserna och red av tills vätskan är såsig. Lägg ner kinakålen igen, rör runt och låt den bli varm på nytt innan du lägger upp på fat och serverar omgående.